You are here: Home / News / Domino’s Pizza for Hoylake? Takeaway Pizza chain Domino’s wants to open a store in Hoylake. 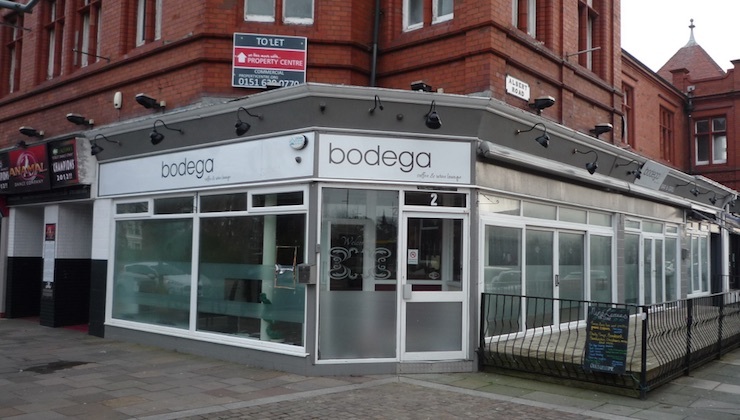 The nationwide takeaway pizza chain Domino’s has submitted a planning application to open a store in Hoylake at the empty Bodega bar (pictured) on Market Street. The premises has been a number of different bars over the last few years but has remained vacant for several months. The application includes “minor alterations and enhancements” to the building frontage. Domino’s suggests the new store would create around 20 new jobs. If planning consent is granted the store could be open from 11am until midnight. This application follows on from sandwich chain Subway opening on Market Street last year. Opinion was mixed prior to Subway achieving planning consent, with existing local businesses, especially Fahy’s Bakery, concerned for their livelihood. Pizza Magic, an existing takeaway business, has traded in Hoylake for over 20 years. Is another national takeaway food chain good or bad for Hoylake? Is it a threat to existing local shops and restaurants? Would a new shop and 20 new jobs in Hoylake be welcome? Have your say in the comments below! Pizza Express would be classier! Expect more of the same when the cinema project gets the green light. we should all be supporting local business and not national chains. Domino’s already supply hundreds of households in Hoylake via it’s delivery service from Upton. This store will no doubt provide an improved service to Hoylake and to the West Kirby area too which is poorly served from Heswall. Monte Carlo ,Marco’s do fan pizza and are restaurants. Don’t think another pizza takeaway is really needed is it?